In 1914, the United States for the first time since 1887 considered an amendment for the political enfranchisement of women. The Senate voted the amendment down, but on May 8, Congress did pass a Joint Resolution, designating the second Sunday in May as Mother's Day. The Resolution also declared that on that day government buildings and homeowners should display the American flag "as a public expression of our love and reverence for the mothers of our country." President Woodrow Wilson then issued a proclamation making Mother's Day an official national holiday. 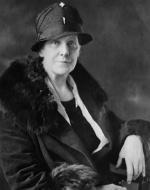 Mother's Day Founder Anna M. Jarvis, circa 1935. 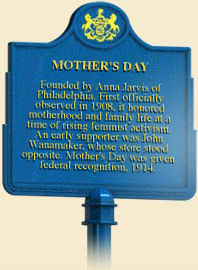 The national recognition of Mother's Day culminated a campaign begun by Anna Jarvis in Philadelphia in 1907, and carried to Congress by Philadelphia department store magnate John Wanamaker. A native of the Appalachian Mountains in the town of Pruntyvillle, West Virginia, Jarvis had in 1892 followed her brother to Philadelphia and there worked as a stenographer and writer. In 1903, Anna and her brother convinced their aging mother to move to the city, and it was after her mother's death in 1905 that Jarvis formulated the idea for her "Mother's Day Movement." Both Anna and her mother were deeply religious. Despite a life filled with sorrow - seven of her eleven children died in early childhood - Jarvis's mother had been a paragon of Christian faith. What began as acts of personal remembrance developed into as special church service for her mother back in Grafton, West Virginia, and from there grew into a letter writing campaign under the auspices of a group that Jarvis named the Mother's Day International Association. It was then that Jarvis came into contact with John Wanamaker, the wealthy Philadelphia merchant, supporter of religious causes, and reform politician, who shared her piety and devotion to American mothers, and also saw an opportunity enhance his business. Jarvis blanketed the nation's churches, women's clubs, and people of influence with letters to adopt the idea of official Mother's Day Services. In 1908, a number of cities held their first Mother's Day celebrations, including Philadelphia, where Wanamaker intended to host guests at his department store's huge 5,000-seat auditorium. When 15,000 wanted to attend, Wanamaker moved the celebration across the street to the plaza in front of City Hall. The 1908 celebration indicated that Jarvis had hit upon a sentiment that had tremendous support across the nation. Anna Jarvis was not the first to come up with the idea of a day to commemorate American mothers. She may also have been influenced by Julia Ward Howe, the author of "The Battle Hymn of the Republic," who in the aftermath of the Civil War hoped to mobilize the women of the world into a movement to achieve peace. In 1870, Howe tried to organize a conference to stop the Franco-Prussian War, and in 1872 started publicizing the notion of a "Mother's Day for Peace," originally June 2, to honor women, peace, and motherhood. The following year, eighteen cities, including Howe's home of Boston, held Mother's Day for Peace celebrations, but when Howe ceased to pay for them, they died out. 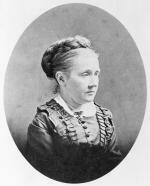 Julia Ward Howe, circa 1875. 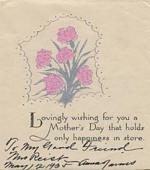 In 1909, forty-six states, Canada, and Mexico were celebrating Mother's Day. At the prompting of Wanamaker, a bill was introduced in the United States Congress to make Mother's Day an official holiday. 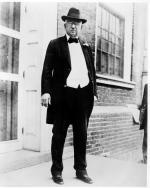 Again, Jarvis led the campaign that in 1914 culminated in the congressional resolution and presidential proclamation. By then, however, the celebration was escaping her grasp, for retailers and the American florist industry were already cashing in on what Jarvis had envisioned as a religious event. Jarvis objected to greeting cards as "a poor excuse for the letter you are too lazy to write," and the sale of flowers and gifts for "Mother" as turning a day of "sentiment" into one of "profit." On the political front, conservatives used Mother's Day in their campaign against the rising movement for women's suffrage, which they feared would destroy American families and American women's nurturing of children. Woodrow Wilson, by Frank Graham Cootes. In 1917, Mother's Day, as a writer in the Homiletic Review put it, demonstrated that "women are still at their old tasks." That summer, Washington, D.C., police arrested 500 women picketing the White House in favor of suffrage. Of these "Silent Sentinels," 168 served prison terms, including twenty-one Pennsylvanians. Jarvis never became involved in the movement for women's suffrage and quit her own job as soon as she could afford to, even though she never married or had children of her own. Jarvis never lost the old-fashioned values her mother had taught her in the West Virginia hills, and became a somewhat cantankerous figure as she approached old age. She was arrested for disturbing the peace when she lost her temper in a New York court when it refused to hear her lawsuit against Governor Al Smith for holding a Mother's Day celebration she opposed because liquor was served. Like many women, Jarvis was a strong prohibitionist - two dry legislators had introduced Mother's Day into Congress. Jarvis came to regard the holiday as her proprietary right, and in 1931 she attacked Eleanor Roosevelt for an "unauthorized" celebration. When she died, in 1948, blind and penniless at the age of eighty-four, she was buried beside her mother in Philadelphia's West Laurel Hill Cemetery. Norman Festus Kendall, Mother's Day: A History of its Founding and Founders (Grafton, WV: Grant Smith Press), 1937.